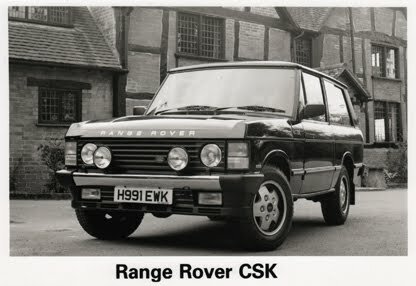 The Range Rover CSK is (also) introduced at this year's Motor Show. The CSK, bearing the initials of Range Rover's original designer, Spen King, is a limited edition model which just 200 will be built. Each of these bears a plaque confirming its exclusivity. Based on the two door model, the CSK is powered by the 185 bhp 3.9 litre petrol injection engine and is available with a choice of manual or automatic transmissions. On-road handling is improved by the adoption of anti-roll bars and sports dampers at both the front and rear whilst roll stiffness is increased by 25 per cent over the standard production model. A four channel power hydraulic anti-lock bracking system is fitted as standard. 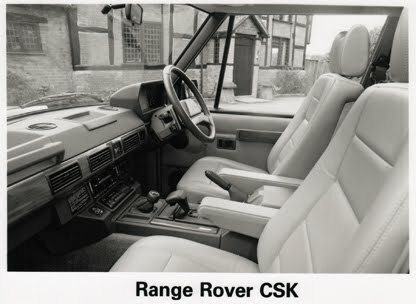 With improved aerodynamics and T rated high speed tyres the maximum speed is increased to 114 mph, where permitted, making the CSK the fastest ever production Range Rover. The interior of the Range Rover CSK is finished in beige with perforated leather seat facings, co-ordinated leather door trims and a perforated leather covered steering wheel, all exclusive to this limited edition. The fascia rail, centre console and door inserts are finished in American Walnut. Standard equipment includes central locking, air-conditioning, an electric tilt/slide sunroof, electric windows, heated door mirrors and a six speaker stereo sound system. The CSK's exterior is finished in Beluga black with contrasting chrome bumpers and silver pinstripe coach lines whilst discreet CSK logos are positioned on both front wings and the lower tailgate. All models also feature a black front spoiler incorporating integral fog lamps. Two further driving lamps are mounted on the grille for improved night-vision. The CSK also features distinctive black-edged silver five spoke alloy wheels, unique to this limited edition. A full range of accessories is available including a autochange CD player for up to 12 CDs and a cellular telephone. This year's Motor Show sees major improvements to Land Rover's product range. 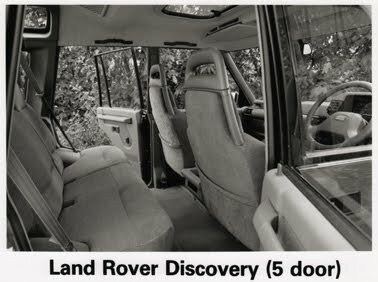 Launched last year, the class-beating Discovery broadens its appeal with the introduction of a five door derivative. Based on the same 100 in wheelbase as the three door derivative the new model is available with a choice of petrol or diesel engines. 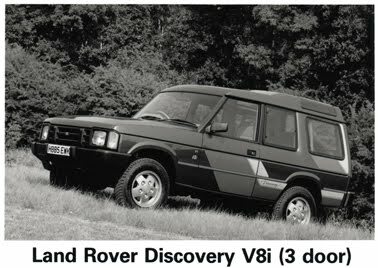 New for 1991 is the introduction of the 3.5 litre V8 petrol injection engine, replacing the carburettor model. Known as the V8i, the new unit offers considerable performance benefits over its predecessor whilst reducing overall fuel comsumption. 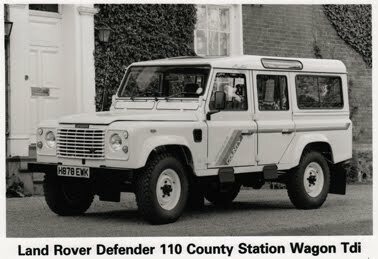 Electric windows, central locking, headlamp powerwash, electrically heated adjustable door mirrors, seven seat configuration, unique alloy roadwheels and a load-space rollerblind. 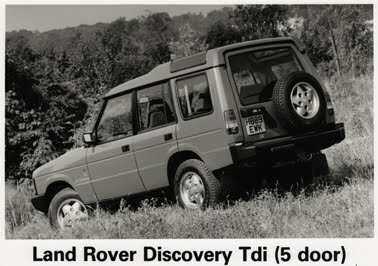 Further improvements are made to all Discovery models for 1991. The introduction of a second colourway called Bahama beige. Improved side window demist capability by the provision of additional air vents mounted in the upper fascia. Introducing of flush-fitting lower seat belt anchorages, resulting in an unimpaired load space area for bulky loads. Intermittent wiper action on the rear window. Introduction of a rear warning light and reflector, incorporated into the rear end door shurface, for greater safety in poor light conditions. Introduction of air-conditioning option on 200 Tdi, previously available only on petrol models. Fitment of grab handle mounted on the E post when the seven seat option is specified. Improvements are also made to the stowage of the rear seat belts when not in use. Addition of two low range speakers in the lower front doors when the high specification audio system is ordered. 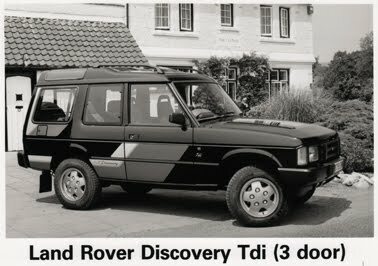 Availability of factory fitted five spoke alloy wheels on three door models, previously available only as an accessory through Land Rover Parts. For 1991 the renowned 3.5 litre V8 petrol injection engine is introduced, replacing the carburettor model. Front: Single rate coil springs. Live beam axle. radius arms and Panhard rod. beam axle with trailing links and "A" frame. 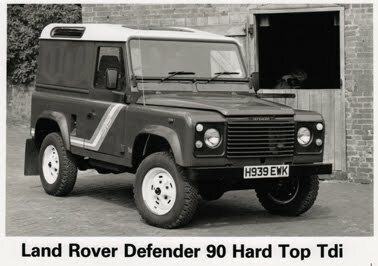 Exterior changes on all models include Defender badging on the front grille and rear, colour-keyed body side tapes, where applicable, and a Land Rover hard logo on the rear, replacing the previous decal. Two new body colours are introduced - a replacement white and a new grey.